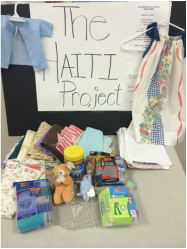 A sample of items collected or made by the Mission Outreach group. "Because﻿ He First Loved Us"
Many years ago the New Haven ladies would meet twice a month at the church for what was then called “Women's Fellowship”. Over the years, the fellowship slowly faded away. After retiring from a nursing career, Janie Gable restarted this group in the winter of 2012. They started by making fleece blankets and donating them to fire victims, the fire department and CPS. Janie collected information on many projects and they soon started making pillowcase dresses for Haiti, birthing kits for Bangladesh, and later that summer, shorts for little boys. In the fall of 2013, they had a Swiss steak supper to help with funding. The dinner was a huge success and they changed their group name to Mission Outreach. The group also sews for the organization Threads of Love. 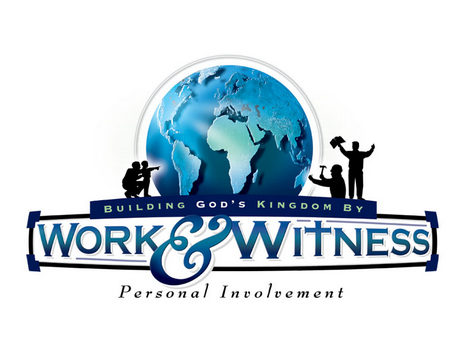 This organization is made up of many churches of many denominations all working together for the same cause. Threads of Love sends their shipments along with missionaries to help orphans and needy children. The Mission Outreach Group is excited for the work they can do in the future to help the needy throughout God’s Kingdom. Working together for His purpose, they have made many memories and have built some lifelong relationships. Interested in helping with this group? 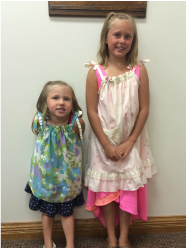 They are now accepting gently used clothing in child sizes 2 - 8. They collect peanut butter, small toy cars, small stuffed animals, pillowcases, fabrics, threads, elastics (½ & ¾”) and rick rack. Of course, willing helpers and sewers are always welcome and deeply appreciated! The Mission Outreach meets every other Thursday at the church and also an occasional Saturday meeting. Meeting d﻿ates and times are listed in the church bulletin. offered at our food pantry. ﻿In combination with the Mid-Michigan Food Bank, New Haven Church of the Brethren runs a food pantry to help members of our community who are in need of food. The food pantry mission was started many years ago. In the past 3 or 4 years, the affiliation with the Mid-Michigan food bank has allowed us to grow and meet the needs of many families in our community. The food pantry is open from 4 to 6 pm on the 2nd and 4th Thursday's of each month. If you are interested in helping with this group, we are always looking for helpers to do grocery shopping, stocking of shelves, cleaning, and assisting with the distribution of food.